3 IN 1 SYSTEM WITH CLIP DIRECTOR®: MULCH, BAG, AND DISCHARGE WITH NO TOOLS NEEDED: Slide the Clip Director® to switch from mulching to bagging or discharge with just one touch. No need for a mulch plug or other attachments. HONDA MICROCUT® TWIN BLADES: SUPERIOR MULCHING AND BAGGING Honda's exclusive twin blade MicroCut System® uses four cutting surfaces that result in ultra fine clippings for superior mulching and more clippings per bag. The end result? A perfect cut, less time emptying the bag, and less work for you. 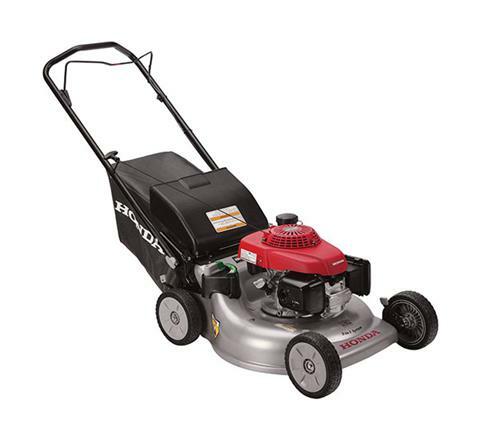 RELIABLE, EASY STARTING HONDA GCV160 ENGINE: Easy-starting, fuel efficient, and powerful, Honda's premium residential GCV160 engines are legendary for providing years of reliable service. 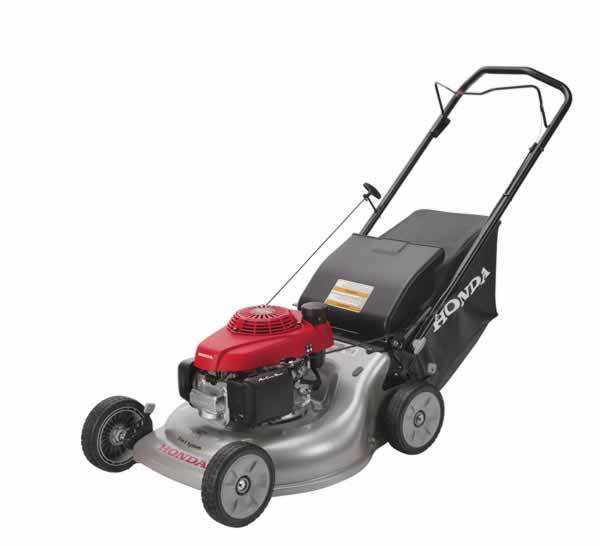 All Honda lawn mower engines are certified to meet 50-state EPA and CARB emission levels. HONDA AUTO CHOKE™ SYSTEM - EASY STARTING: No engine choke required! Just start the mower and go! EASY FOLD QUICK RELEASE HANDLE FOR EASY HEIGHT ADJUSTMENT AND STORAGE: Easily adjust the handle to 2 comfortable mowing positions, or fold over for storage. PUSH TYPE: Lightweight and manueverable. 21 IN. HEAVY DUTY MOWING DECK: Rugged, durable steel for long life. 6 POSITION HEIGHT ADJUSTMENT (1 1/8 IN. - 4 IN. ): Convenient height adjustment levers to set mowing height for lawn conditions. LARGE 8 IN. WHEELS WITH REAR BALL BEARINGS: Better maneuverability, smoother drive, and increased durability. LARGE EASY OFF 1.9 BUSHEL GRASS BAG: Our large capacity grass bags are balanced so they are easy to empty, saving you time and effort. ZONE START SAFETY SYSTEM: Quickly stops the engine when you let go of the flywheel brake lever. MANUAL FUEL SHUT-OFF VALVE: The fuel valve can be shut off for transport, storage, or to performance maintenance. 3 YEAR RESIDENTIAL WARRANTY: You can rest easy, knowing your lawn mower is covered from top to bottom for 3 full years. 1 1/8 - 4 in. 6751 County 426 M.5 Rd.